4:00 pm: Grand Menorah Lighting with local dignitaries. Honoring our dedicated firefighters and first responders. Come on out for a Grand Menorah Lighting on Trinity Commons. Enjoy Chanukah Music and Treats. On Thursday we will be traveling to bring Chanukah Celebrations further North. If you or anyone you know in the area wants a Chanukah visit please emailrabbi@jewishchico.com or call us at 5308091662. Student Shabbat Dinner - Chanukah Style! Join us for Shabbat Services and a BAR MITZVAH celebration. Come out for one last fun (indoor) Chanukah celebration! Chanukah Music, Crafts, Games and Treats at Chico Mall! Living in the dorms with the no-fire rule? 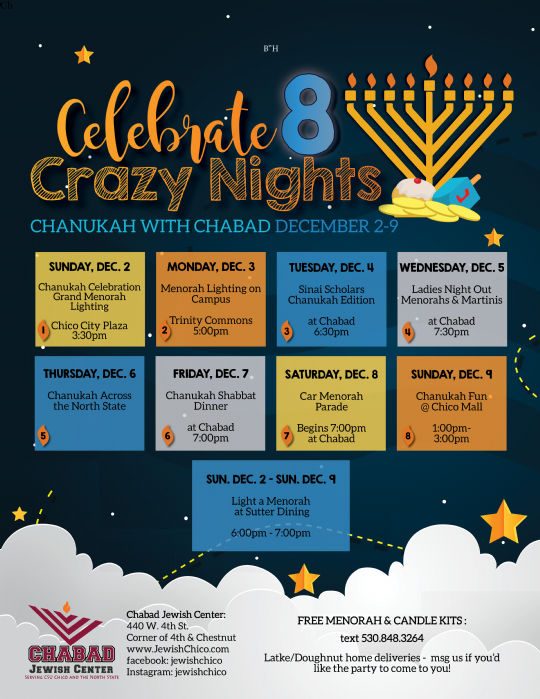 We have set aside a designated area in West Dining of Sutter Dining Hall for you to come and light your own menorah (menorah and candles provided). Chanukah Treats served nightly. DO YOU NEED A MENORAH OR CANDLES?